A great case can be made for upgrading your home’s insulation and for air-sealing gaps and cracks sooner rather than later. These improvements typically pay for themselves in 6 or 7 years — and then continue to generate savings for as long as you live in your home. If the price tag for a full energy upgrade is not in this year’s budget, however, here are 10 low-cost improvements that that will make your home a lot more comfortable this winter. 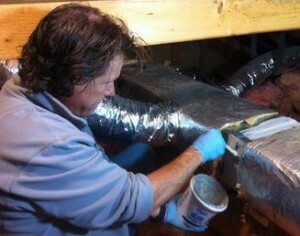 The price of a can of duct-sealing mastic will typically pay for itself in a single heating season. Dr. Energy Saver contractor in your area will perform air-sealing tasks for you. 3. Baseboard and crown moldings that run along exterior walls are also sources of cold air infiltration. A great deal of air leaks into your basement where the framing meets the masonry foundation. From there it contributes to cold floors and can easily infiltrate your living space via small cracks and gaps in flooring. Cut rigid foam board insulation to fit snuggly between joists at the rim, or band joist. Use caulk or a foam sealant to seal around the edges of the rigid foam boards. Cost: $150 to $250.